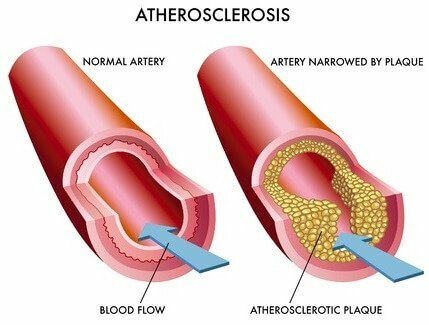 Atherosclerosis or arteriosclerosis refers to a buildup of plaques in the arteries and thus their hardening and narrowing. 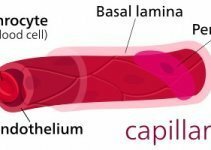 Arterial plaque is an abnormal deposition of fatty acids, cholesterol, calcium, inflammatory cells and connective tissue on the inner side of the large and medium-sized arteries . Plaques can start to develop in childhood; most older people probably have some plaques but these obstruct the blood flow only when they occupy 50-70% of the artery diameter . The above factors can inactivate nitric oxide, which normally dilates the arteries and decreases inflammation in them . A plaque can be stable or unstable. An unstable plaque, even if it appears small on angiogram, can rupture and a blood clot (thrombus) can develop on the top of it and additionally obstruct the artery . A part of the thrombus (embolus) can detach and lodge further in the artery where its diameter is smaller and completely blocks it, which can cause, for example, heart attack. The exact cause of atherosclerosis is not known but involves a damage and inflammation of the inner arterial layer (intima). Atherosclerosis in early stages usually does not cause any signs. In developed atherosclerosis, a doctor can detect weak pulse in the posterior tibial artery behind the inner ankles, radial artery in the wrists or carotid artery in the neck, and, sometimes, bluish discoloration (cyanosis) of the lower legs and leg ulcers. Atherosclerosis is more common in men than in women and it causes symptoms in mean earlier (typically after 45 years of age) than in women (usually after 55 years of age) . Estrogen hormones seem to be somewhat protective against atherosclerosis, so this is why women often develop it after menopause, when the estrogen levels fall . Most people with atherosclerosis who have no symptoms are not aware of the condition. 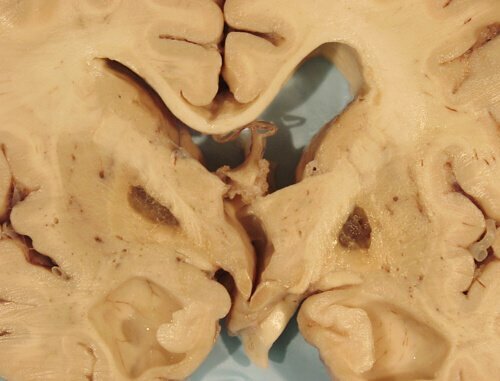 Sometimes, a doctor accidentally detects atherosclerosis during investigations for other conditions, such as chest ultrasound or computed tomography (CT) of the brain. Atherosclerosis cannot be cured but it can be treated. Smoking cessation , weight loss (in overweight individuals with high blood pressure)  and aggressive treatment of high LDL cholesterol and blood pressure [59,60] can–at least partly–reverse atherosclerosis. If you have a strong family history of coronary heart disease or stroke, you may be not able to completely prevent atherosclerosis but you may slow down its development. Vegetarian [33,34,35] and Mediterranean diet (whole grains, fruits vegetables, olive oil, nuts, seeds, fish, wine) [36,37,38,39,40] have been associated with the lower risk of atherosclerosis than other diets. There is SOME EVIDENCE that replacing some of saturated fats (processed meat, beef, pork and lamb) with polyunsaturated fats (fatty fish) in the diet can reduce the risk of coronary heart disease [63,64,65]. Regular consumption–at least twice weekly–of fatty fish (mackerel, salmon, sardines, halibut, trout), which are high in omega-3 polyunsaturated fatty acids EPA and DHA have been associated with lower risk of coronary artery disease [35,48,49]. However, there is INSUFFICIENT EVIDENCE that fish oil supplements would help to prevent coronary heart disease or atherosclerosis in general [28,29,30,48,49]. In some people with high blood pressure and high sodium intake, reducing sodium intake can lower blood pressure and thus decrease the risk of coronary heart disease [50,51]. High consumption of trans fat from foods like French fries, cheeseburgers, chicken nuggets, commercially baked biscuits, crackers, doughnuts and pies, hard margarines, vegetable shortening, other foods with added “partially hydrogenated oil” or Vanaspati ghee have been associated with increased risk of atherosclerosis [43,44,45,46,47]. High consumption of processed meat (bacon, bologna, corned beef, ham, hamburgers, hot dogs, deli or luncheon meats, salami and sausages), which contain preservatives, such as salt, nitrites, nitrates and nitrosamine, but not unprocessed red meat (beef, pork and lamb), has been associated (not necessary cause-effect related) with higher incidence of coronary heart disease . Maintain normal blood cholesterol, triglyceride and glucose levels. Eat what helps you achieve the above goals.